Some changes are taking place in the latest issue of Titans. Donna Troy takes over command of the team, and Kyle Rayner joins the line-up. Honestly, between Kyle joining and Beast Boy being out of control with his body, this makes the book feel a bit like the final days of the New Titans, in the early 90s. That is not the best period to be reminded of. And this issue is a bit slow as well. There is a lot of discussion about what to pursue next, and even a meeting with Batman to discuss that, and Kyle’s joining up. Beast Boy provides what action there is in the issue. Things get set up for a confrontation between the Titans and the Cult of Brother Blood, which I suppose will take place in the next issue. But to be frank, this book has really lost me in its last three issues. Despite all the effort put in to give this team a direction, the breaking of the Source Wall and the hapless innocents who gained powers because of that is not proving to be a very dynamic story arc. 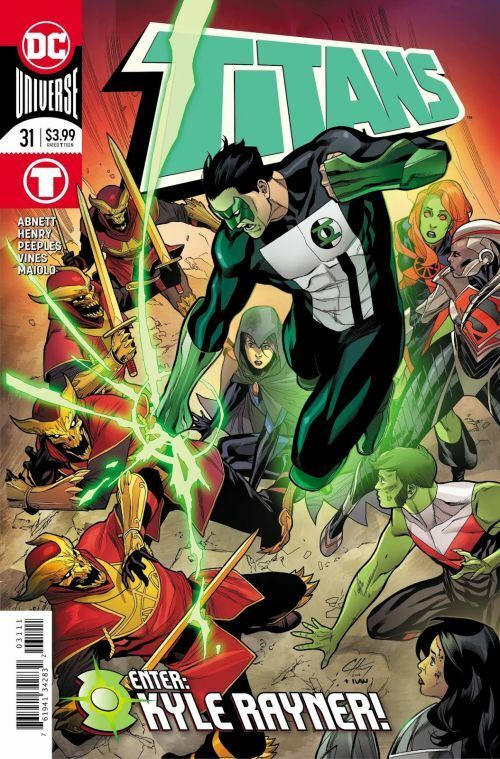 Kyle Rayner just seems wildly out of place on this team. It was one thing for him to become a member of the New Titans shortly after gaining his ring, but Kyle is an old hand now, one who gained massive power, which he then forwent. He had a long tenure with the Justice League. To put him in the Titans just to wedge in another power player seems forced. And I fear they will resurrect the romance between him and Donna Troy, which was also a non-starter. I’m glad I am enjoying Teen Titans, because this book is not going anywhere that excites me.